Survey Analytics had a wonderful opportunity to host an online seminar training session with Kathryn Korostoff of Research Rockstar (www.researchrockstar.com) called, "Divide and Conquer: Practical Steps to Market Segmentation" on Wed January 20th, 2010. 1- In the process of doing a segmentation research it is important to set your own objectives and continually revisit your objectives to ensure you are staying on budget during the entire project. 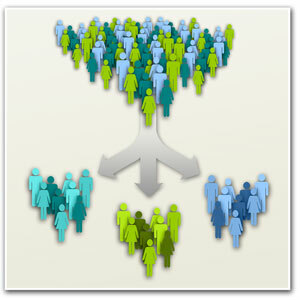 2- You must also spend time to decide if it is demographic based or research based research. For example: A mock trial would need to reflect the demographics of the county to which it is held, whereas, a smart phone study may want to target current smart phone users who can offer a lot of feedback on a features and benefits research study. 3- Make sure your team spends qualify time brainstorming from beginning to end. Often times brainstorm sessions are done too quickly, are one-sided, or certain sections were not thought through well enough. In the end it would just cost more money and more time to finish your research project. 4- Research what will be the most efficient and cost-effective way to research your "Slam Dunk" audience. This is my favorite word used by Kathryn during the seminar. I've always known it as Core Customers, but Slam Dunk sounds much more fun. Simply put: Effective research + targeted marketing campaign towards Slam Dunk audience = higher revenue. In a do-it-yourself economy, technology has been the key cost saver for many companies who need to do in-depth research. It can also help avoid common pitfalls found in research studies. Survey Analytics survey software tools have aided many clients in preventing poorly written surveys (survey wizard) and strong data analysis tools that are available right away. With Kathryn's practical tips on segmentation and easy-to-use market research software found on Survey Analytics, you are ready your company's market research goals to a whole new level.